« A new Masthead for the Blog! This is one of the pasta recipes in my new book, Healthy Eating for Life. You can prepare the nut mix beforehand and reheat it very gently when you come to cook the pasta– stress-free cooking, in principle! Hazelnuts roasted are particularly more-ish*. Mixed with olive oil, chili and garlic and served, as here, with nutty wholewheat pasta, they are irresistible! pecorino cheese–if available, a couple of tablespoons–bearing in mind its saltiness. Heat both oils in a pan and add the garlic. Colour it gently, taking care not to burn it. 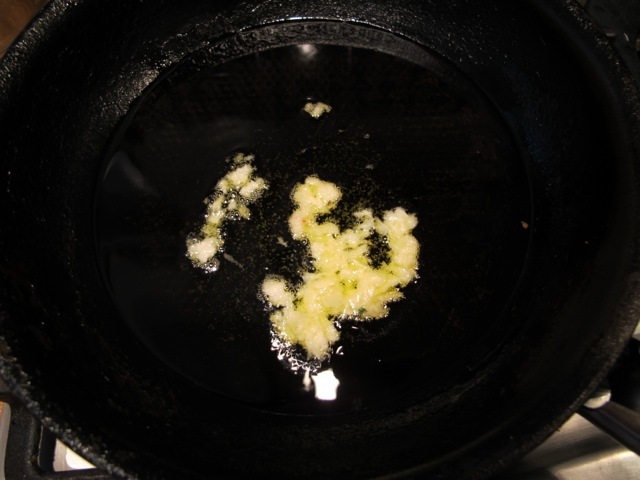 Turn off the heat and remove the garlic from the pan to prevent it burning–a sieve with a metal net does this safely–and let it cool. Add the chili to the warm oil in the pan. Gently reheat the oil and chili in the pan. 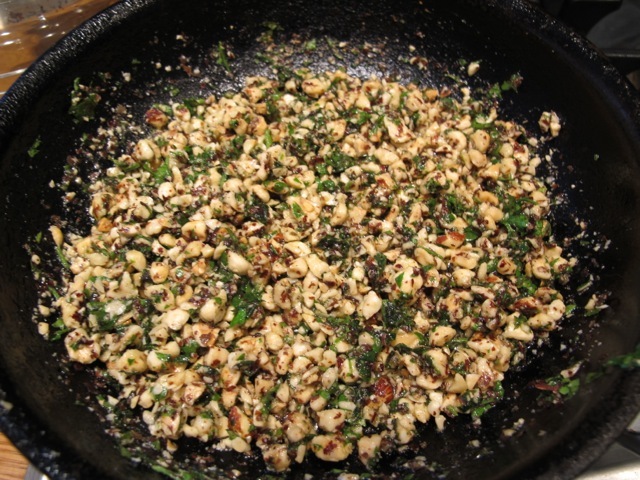 Add the hazelnuts and the parsley to the pan and cook briefly over a low heat–about three minutes. 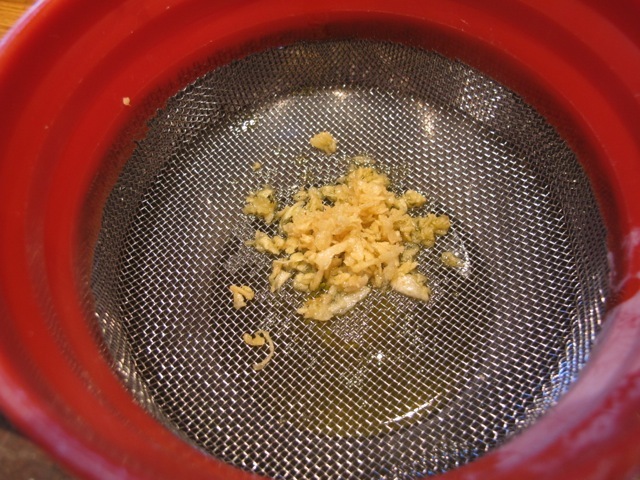 Turn off the heat and mix in the sautéed garlic. Bring a large pan of water to the boil with a dash of salt. Add the pasta and cook it to taste. 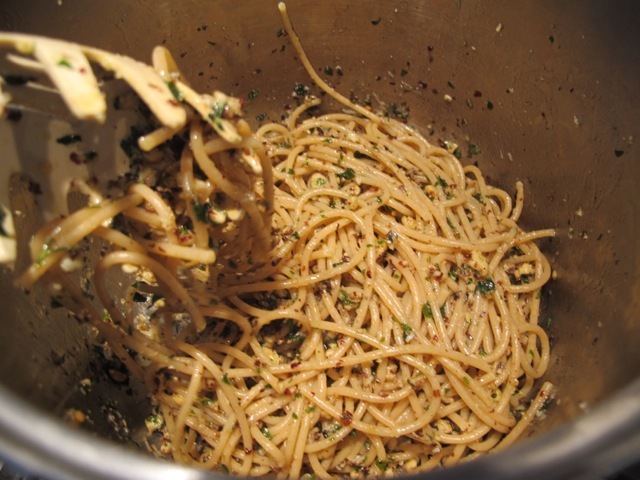 When the pasta is done as you like it–drain, remembering to save 3 or 4 tablespoons of the water. 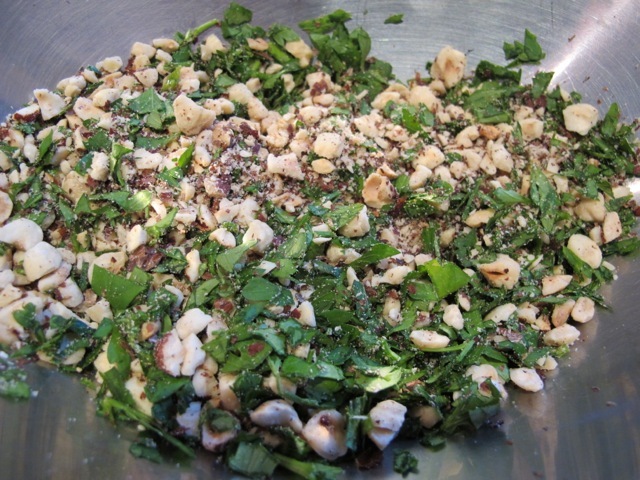 Return the pasta to the warm pan you cooked it in and add the nuts, parsley, garlic and cheese(s) and mix thoroughly. Add a couple of tablespoons of the warm pasta water to loosen the sauce a little. Serve immediately (it cools down quickly)–with extra cheese and a swirl of olive oil, if you like. Spread the hazelnuts over a shallow oven tray and place in the oven. Check after 5 minutes. Taste and fragrance are the guide. Taste one to check for crunchy doneness–roast them a little longer if you feel they need it. Cooking time depends on their size and your oven! Let them cool before processing them. Oh….YESSSSS! Does this look delicious. One of my favourite ways to eat spaghetti is” Aglio e Olio” I know I will love this. I also love hazlenuts. Very European. I use Hazlenuts in Christmas Cookies all the time. I have never seen “hazlenut oil” in the markets in the US but you can easily order it on the internet. This will be a must try for me. Thanks Robin! Hope you, Meredith, and all of the chickens and cats are fine. You can get hazelnut oil in some supermarkets in the US. I didn’t have a problem finding it, and I live in a relatively small town about an hour from Philadelphia. I shall definitely try this. The walnut pasta is wonderful, but my husband complains about small bits of shell! It’s very difficult to eliminate them completely (any tips?). I think this one may be the answer. I like stress-free cooking too. Perhaps your husband should shell the walnuts! Then he’d find it harder to complain! !